Shelley was born in South Africa, to a South African mom and a British dad. In 1973 they felt they could no longer live under Apartheid, and settled in England. Shelley feels she has come from one rainbow nation to another, and loves the diversity, the humour – and the tea – which characterises Britain. Shelley completed an English degree at Southampton University and an M.A. in English and History at Reading University. She’s been a teacher (She loved it), a local reporter, a stuffer of envelopes, a bouncer at a teenage disco and a shop assistant. Shelly lives in Buckinghamshire with her husband and two sons. She reads like a demon, has a penchant for slapstick humour, and eats as many salted caramels as she can lay her hands on. Shelley was the first person to see my work, (outside a wonderful mentor and my family,) and her cheery and honest manner helped me to have faith in my work that there might be some promise. 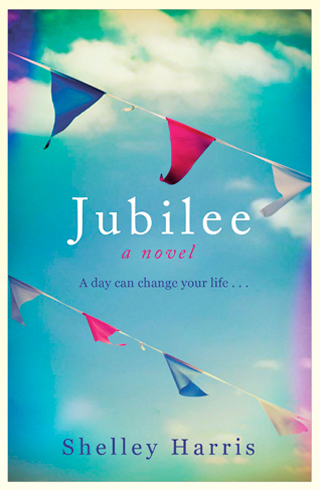 Her debut novel Jubilee was an acclaimed success with both critics and readers. So, naturally, I wanted to find out how she went from ‘stuffer of envelopes,’ to bestselling author. Hi Shelley, thank you ever so much for dropping in to chat. As always, I thought we’d start at the beginning. What books inspired you growing up? Had you always aspired to being a writer? It’s fabulous to be here, Jody – thank you for inviting me. As a kid I loved Winnie The Pooh and Malory Towers, the Malcolm Saville Lone Pine books and anything about time travel. One year, I read The Railway Children and The Amazing Mr Blunden over and over again, alternately. As for whether I aspired to being a writer: yes, absolutely, from a very young age. But then I also wanted to be an actor, so I can’t credit myself with too much foresight. I wanted to explore what it means to be British, and especially (I think this was my own unconscious question as I was growing up) how to become British. 1977 was a strange, watershed year; the Jubilee celebrations which brooked no mainstream dissent. The National Front growing in strength and then – not long after the Jubilee itself – imploding (only for its politics to resurface in other places). I wanted to see what life might be like for a Ugandan Asian lad exiled by Idi Amin, growing up in the middle of all that. How would he make his way through? I remembered what it felt like in those early years in Britain, the constant watching to see how things should be done, and that’s how I started with Satish: he’s a watcher, a learner. You talk about the Ugandan Asians exiled and finding a home in the UK, What was it about their journey that caught your imagination? Every cohort of immigrants brings something new and special with them (which in pretty short order becomes something familiar, a new facet of Britishness), but these exiles were especially remarkable, I think. They left Uganda with almost nothing, and when they arrived there were NF marches protesting their presence. But they were so tenacious and so determined – Britain would be a lesser place without them (and their children) now. There are plenty of mysteries in the book, and it’s no surprise that many of the reviews pick out the plotting as a major strong point. How did you go about plotting Jubilee? What was your process? And did it involve salted caramels? I wanted to explore the idea of a single event interpreted in many different ways by the people involved, and also to look at how we remember (and how we go about deliberately forgetting). But finding a way to structure all that, wasn’t a simple process. The first draft told the story as a series of interviews (and the memories prompted by those interviews). It included a journalist who was writing a Where-Are-They-Now piece about the subjects of the iconic photo, and all the characters were given equal weight. A year into the writing, I sent what I’d done to the Literary Consultancy, and the editor who read it gave me bad news: readers would find it hard to gain purchase on the story because I didn’t have a hero. To make the book work, I’d have to ditch the journalist character and completely restructure. I was gutted – but I started again. This time, I placed Satish front and centre, and told two stories: a growing mystery in his present-day life, and the truth about what happened in 1977. I made sure there were always unanswered questions in both timelines to keep the reader moving forward. Can you tell us about your path to publication, it involves a trip to the York Festival of Writing doesn’t it? It does! I went to the first ever York Festival in 2010, and entered the Friday night competition, which involved reading out a thousand words or so of Jubilee (then called Happy and Glorious). There were nine other writers doing the same, and an industry panel ready to deliver some X Factor-style waspish comments after each reading. Then the audience voted for a winner – and it was Happy and Glorious. I still feel completely thrilled by that. Winning got the attention of some of the agents there, and within a couple of weeks I had a few offers of representation. I signed with Jo Unwin pretty swiftly – we had really clicked, and I knew I’d enjoy working with her. Three months later I signed a two-book deal with Weidenfeld & Nicolson. Can you walk us through that first year of publication? How much had you expected? What surprised you about the reaction to Jubilee and did you learn anything from the experience? I expected blue skies and butterflies and angels. When you want to be published so much, you really do think that it will bring world peace and put you into a permanent state of bliss. In the event I had a lovely publication year, with a prize shortlisting, a Radio 4 reading and Jubilee being picked for the Richard and Judy book club. So it’s going to sound disingenuous to admit that what surprised me about the reaction was simply that readers liked it – readers I’d never met. It was a proper revelation. To be honest, I was also surprised that it became a book at all – a real one you might buy in a shop. When you’ve been working on something privately for so long, that can be a shocker. Reading this back, I’ve realised it sounds totally contradictory – but I felt all of it, all at once. I learnt loads from the post-publication experience: that your writing life goes on much the same, that you do not – ever – stop learning, that being published does not make you capable of a perfect first draft. And I learned that you really need to find a way of detaching commercial pressures from the process of making art, because each requires a totally different mindset; if you try to do both at once, your head will explode. It came from an odd place; I had a bit of a wobble when I turned forty, and used Julia Cameron’s The Artist’s Way to help me get a bit more fun back into my life. One of the things I did was to cycle round my small town, secretly leaving poems for people to find. I discovered the power of the anonymous good deed: how thrilling it can be to work in secret doing something you believe in – even something small and silly. And then I thought: what if a woman had a midlife crisis and could only cope with it by taking on the persona of a superhero? What if those small, silly good deeds became frighteningly large and dangerous? What would she do then? Jenny fights crime in a… unique… way, there’s a lot of humour in the book. How important was it to show an everyday hero without the gadgets or a sidekick? Were you ever tempted to give her a superpower? It was absolutely vital; this is not a superhero story, for all that some of it is inspired by the classic superhero narratives. I did, for a very short while, toy with the idea of giving Jenny a sort of superpower, a hyped-up version of a real human skill, but I dropped that pretty fast. 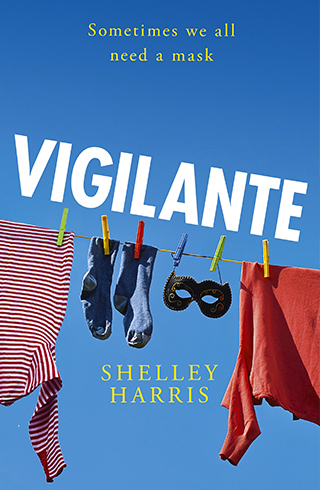 Vigilante is a story about a real woman in crisis, and about what happens to someone who has lived her whole life in a sexist society, when she finally decides to fight back. What is your ‘typical’ writing day? A bit of mindfulness, followed by three or four hours of writing. When readers pick up your books, what would you most like to hear them say? That their emotions are engaged. What would you least like them to do/say? That it was all a bit meh. If you could have written any book, which one would it have been? The Amazing Adventures of Kavalier and Clay. What is your ‘tic’ word when writing? There are loads. I’m quite fond of ‘shift’. Least favourite word? I’m going to go for two in conjunction: gated community. What would you most like to develop in your writing? I’d like to stop being such a miserable git while I’m doing it. Thank you for dropping in to chat, Shelley! As well as teaching at various festivals (eg York and Winchester) and at places like London Writers’ Cafe, Shelley leads tutored retreats. The current one (April) is sold out but she’ll be organising more in the future. Keep your eyes peeled and I’ll keep you updates on when you can book!